The Metabolism Miracle by dietitian Diane Kress, owner and director of the Nutrition Center of Morristown, says there is a specific reason why some people can eat all they want and never gain weight, while others have to struggle. She claims that at least 45 percent of dieters have a condition called “Metabolism B” that causes their body to more easily convert carbohydrates from food into excess body fat. In her book, The Metabolism Miracle, Kress outlines a weight loss plan that is based on a program she has offered to thousands of patients in New Jersey who have successfully dropped extra pounds and regained control of their metabolism. Diane Kress says that people with “Metabolism B” cannot eat a high amount of carbohydrates without gaining weight. A special diet is required that involves limiting the intake of foods containing carbohydrates to allow them to get back into balance again. The first part of Metabolism Miracle takes eight weeks and is designed to stabilize blood glucose levels, detoxify your liver and initiate the shrinkage of your fat cells. This phase called “Carb Rehab” involves a very low carbohydrate diet with an emphasis on lean proteins and non-starchy vegetables. Dieters can expect to see an improvement in their blood pressure and cholesterol levels, increased energy and a reduction in body weight. In the next phase you start to transition to a higher intake of carbohydrates by gradually adding “healthy carbs” back into your eating plan. Low-glycemic carbohydrates are consumed in small amounts at regular intervals during the day. You will consume a food containing 11-20 grams of carbs before exercise, at breakfast, lunch and dinner. It is also important not to go more than five hours without eating a carbohydrate-containing food. The final phase is called “Lifetime Weight Maintenance” and provides the tools you need to keep the weight off for good. You will learn the precise amount of carbohydrates that works for you, as well as how far apart to space your servings of carbohydrate foods. Egg whites, low fat cottage cheese, fish, lean beef, chicken breast, turkey,bacon, almonds, peanut butter, low-carb bread, wild rice, cauliflower, eggplant, spinach, tomato, lettuce, cucumber, broccoli, asparagus, apple, strawberries, dark chocolate, Splenda, green tea. Exercise is regarded as a critical link for anyone on Metabolism Miracle because it helps to decrease blood sugar, regulate insulin release and stimulates your muscles so you can burn more fat. You should do thirty minutes of exercise a day but you don’t have to do it all in once. It is perfectly fine to break it up into two or three segments of ten to fifteen minutes each. The type of physical activity you choose is up to you but some possibilities include walking, swimming, gardening, biking, yoga, weight training, tennis and swimming. 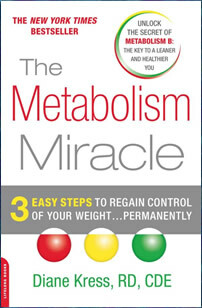 The Metabolism Miracle: 3 Easy Steps to Regain Control of Your Weight Permanently retails at $15.95. Frequent meals and a relatively high protein intake helps to reduce appetite. May assist metabolism B dieters who have not been successful on standard weight loss plans. Includes a meal plan and recipes. Allows the consumption of alcohol in moderation. Requires elimination of many foods including bread, potatoes, rice and desserts. Not particularly unique compared to other low-carb diet plans that are available. Some dieters may experience fatigue or constipation in the first phase of the program. The metabolism B Diet contains a relatively high amount of fat. Encourages consumption of artificial sweeteners. The Metabolism Miracle offers a solution for dieters who may not realize they have the condition called “Metabolism B”, which influences their capacity to process carbohydrates. By following the three-step plan outlined in this book dieters will repair their metabolism so as to lose weight and improve their health, as well as learn how to create a healthy lifestyle plan to keep the weight off forever.